« What Is Asset Allocation For Everybody Else? There is a price war going on among fund sponsors with some ETFs now having expense ratios from 3 basis points to 5 basis points. Keeping costs low is key to long-term returns generally, and specifically to index funds. 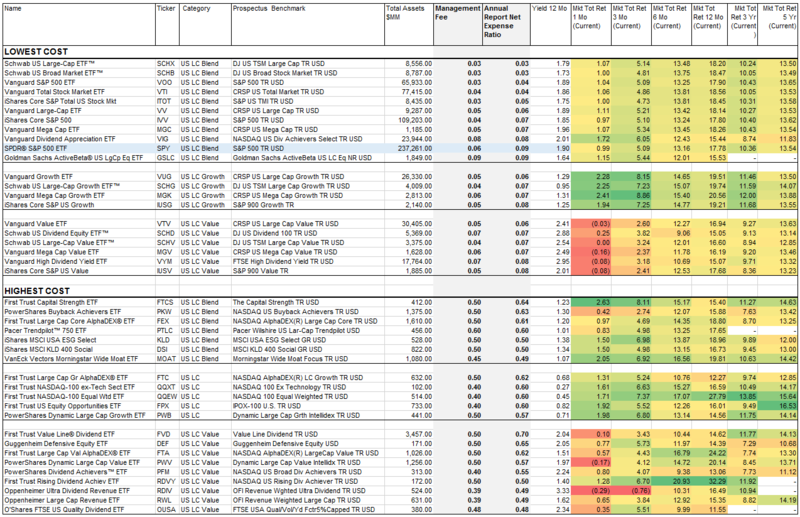 Here is a list of the 21 lowest expense ratio and 21 highest expense ratio US large-cap ETFs that have at least $100 million of assets under management. The largest ETF (the S&P 500 tracker, SPY) is among the least expensive at 9 basis points, but more expensive than two other S&P 500 ETFs (IVV at 7 basis points, and VOO at 4 basis points). For a $1 million position, 1 basis point amounts to $100 per year; or $200 extra return per year with IVV and $500 per year extra return with VOO. If all you want to do is buy and hold the S&P 500, VOO probably is the most sensible approach. On the other hand, if you want to be able to sell covered options on your S&P 500 position for income, you need to stick with SPY. Schwab has a US large-cap and a US broad market (also large-cap) ETF at 3 basis points. Before you know it, some very large ETFs may have zero expense ratios — it could happen. Some sponsors may chose to offer “lead funds” such as a US large-cap fund at zero expense (operating at a loss) to gather assets on the assumption that if they can capture a core assets, they have a good shot at capturing other assets that are operated profitably — certainly that has been the case with money market funds for the past 8 years. The combination of mega-size and revenue from securities lending should make is possible to operate at least marginally profitably on some funds to either gather assets, or compete to retain assets against others who lower fees to gather assets. When funds lend securities, they earn a fee, which is shared partially with the manager in most cases (not shared at Vanguard). iShares, for example keeps from 15% to 28.5% of the securities lending revenue on it funds. If sponsors could live off of the lending revenue share alone, and also make certain competitive asset gathering or retention decisions, expense ratios on some funds could go to zero. Whether sponsors do or do not keep a share of securities lending fees, as expense ratios approach zero (and 3 basis point to 5 basis point expense ratios are approaching zero in effect), the impact of securities lending begins to have a significant effect on the tracking error of an index fund — such that on occasion the fund could outperform its benchmark even with the drag of a management fee. Other important factors that impact tracking error include the amount of cash held for liquidity; the effectiveness of sampling if index replication is not used; and the timeliness and accuracy of rebalancing and reconstitution. Anyway, we are approaching the time where Warren Buffet’s concern about Wall Street drag on returns, and the damage to investors, may be approaching an end for large index funds. It is typically said that you cannot buy an index, only a fund tracking an index. Well, they two are approaching the point of being one and the same. Overall, the highest costs US large-cap funds, with expense ratios from 48 to 64 basis points did not do worse than the lowest costs funds. In fact if you simply average the returns (not asset weighted), the highest cost group did a little bit better than the lowest cost group. That was not due to better management, but to somewhat specialized large-cap strategies that did better, such as technology oriented NASDAQ exposures. That shows that it is possible for higher fees to be justified in some cases by deviating from the broadest indexes, but that is a case-by-case situation. If you are buying broad indexes, pay really close attention to expenses as one of the primary drivers. For specialized funds, category relative expenses can be important, but absolute expenses may not be as important as for broad index funds. 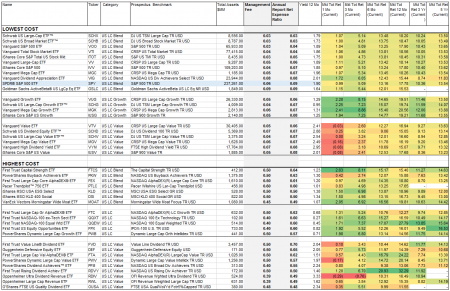 This entry was posted on Monday, May 1st, 2017 at 11:05 AM and is filed under Analysis, ETF Performance, Investment Strategy. You can follow any responses to this entry through the RSS 2.0 feed. Both comments and pings are currently closed.